Poison Ivy Itch Relief Remedy That Works Fast! Poison Ivy itch is the worst! Do you want to know one of the best temporary itch relief home remedies for poison ivy rash? Believe it or not, this works. I have done it myself (multiple times) and can say with certainty that this will help with poison ivy itch. Run HOT water over the affected rash area, as HOT as you can tolerate without burning yourself… the HOTTER the water (don’t burn yourself) the more effective it will be to eliminate the itch! It’s easiest if the poison ivy rash is on an extremity (fingers, arm, leg, etc..) enabling you to run hot water over it in the sink. Start rinsing the rash with hot water that you can tolerate. Then increase the water temperature to the HOTTEST temperature that you can tolerate without burning yourself. Note: I must warn you that the initial itch sensation from the hot water contacting the affected area will be quite strong. At least it was for me. You will have a very intense urge to scratch the itch – but do not scratch! This sensation will be worse right when you start, but it will reduce after about 30 seconds to a minute or so. You will know when you have reached a hot enough temperature when you begin to feel the intense initial poison ivy itch sensation. Trust me though – it’s worth enduring because this will cure your itch for several hours! Run the hot water for about two minutes. The urge to scratch will begin to reduce in intensity. After the hot water rinse, the itch will be completely gone for several hours! It really works! Note: A very HOT bath will work too. Your immune system reacts with the poison ‘urushiol’ oil that gets on your skin from coming into contact with the poison ivy itself. In response, your immune system generates histamines at the affected areas. Hot water draws out the histamines from the skin. It takes the body several hours to build up more histamine afterward. Tip: Taking an over-the-counter antihistamine such as Benadryl also helps, but will make you drowsy (good for bedtime though!). When you first realize you have been exposed to poison ivy, you have about 15 minutes (some say up to 2 hours) to greatly reduce or eliminate the poison ivy itch symptoms. Immediately run lots of cool or cold water over the skin. The best action is to take a cold shower and let the water rinse off the poison urushiol oil before it bonds with the skin. The water will be spreading the oil around so you want the pores to close. That’s why you need cool water in this phase. You need to rinse long enough for all of the oil to run off completely. Do not use warm or hot water during this first step, which will open the pores and allow the poison urushiol oil to penetrate. Poison Ivy and Poison Oak have 3 leaves. The leaves appear somewhat oily or shiny. They will sometimes have a reddish hue depending on their age and the season. 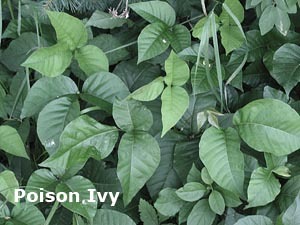 Poison Ivy leaves are more pointed than Poison Oak leaves. I tried the hot water trick and it totally works! Thanks for posting this article. I’m glad I was able to help someone with this. I am susceptible to getting poison ivy and am always aware when I’m walking off the beaten trail. The times when I have been unfortunate to get it, the hot water trick has worked. The only issue is bearing through the very heightened itch when the hot water is running over the affected area… but after a minute or two when you remove the the hot water, it is well worth it! No itch for hours later! I just got my first case of poison ivy last Saturday, I tried the Fels Naptha soap, which helped some, but the hot water is the best. I soak in the bath with some lavender oil that helps with inflammation. Thanks for the tips! Thanks Sophie, yes I have found that HOT water works really well to stop the itch (for awhile). The problem is the MAJOR initial itch when running the hot water over the skin – but it’s well worth it given the hours of relief afterwards! I wish I had known this trick two weeks ago when I first got my poison ivy. I am so sensitive to it that I have to keep prednisolone on hand for the minute I get symptoms. Got it so bad one year, both arms were swollen to the point that I couldn’t bend my elbows. On steroids for 4 months because of it. I swear I just look at it and break out. Yes this remedy really works, although the itch is torture while you’re running the hot water – but it is well worth it to be relieved of itch for several hours afterwards! Two products everyone who spends time outdoors in places where poison oak/ivy are common should know about, Tecnu and Ivy Block. Ivy Block is a lotion you apply before potential contact with the plants, like before hiking. Tecnu is type of liquid “soap” that removes the Poison oak oil (urushiol). I’ve also heard Dawn dish soap works too. I’m extremely sensitive to poision oak; Tecnu has been a life-saver. Hi folks, When I was a youngin – I’m 77 years old – I spent all the time I could in the woods in South Jersey. If there was Ivy Poison 1000 miles away I got – well-maybe-not-that far, but anyway, when coming home one day, my darling grandmother told me to get in the shower and wash myself down with “Fels-Naptha” soap (Yellow soap). Whenever I got home quick enough after my visit to the woods and washed down with ‘ole yellar’ I never got IP afterwards. They say the system changes every 7 years – I don’t know it that’s true or not but I live in MO now and have never gotten IP again. Thanks Ron, I’ll give that a try too. I’ll try anything that might help. There is an over the counter product that basically scrubs the oils off of the skin. It is called Zanfel, it is a little pricey but it works, but you have to catch it early. My husband says that if you notice you’ve touched poison ivy, if you rub dry dirt on the affected area, it will take the oil off and save you from most of the itch later on. Remember that the plant oil is on your clothes and can re-infect your skin. Wash clothes you were wearing while you came in contact with the plant in hot water with a small amount of bleach. I use Zanfel. Great stuff. If you can’t use Zanfel hot water would work. Let me tell you what NOT to use on poison ivy. MY wife and I were clearing some areas on our land and my wife got into a number of poison ivy vines. Since we knew that her arm had come in contact with the vines in an effort to cleanse her arm, I suggested Clorox. She soaked her wrist in Clorox and while it seemed to clean her arm of the oils it also “burned” her wrist and bleached it as well. So now my beautiful wife has a pure white spot on her wrist….and she reminds me of my idiotic suggestion regularly. For those that take their 4-legged partners with them into the woods need to know that if their dogs come in contact with PI, it can transfer to their fur and if one happens to pet/groom/etc, the oil WILL transfer to you. I know this first hand due to a K9 partner constantly coming into contact with it during the summer months and naturally during the course of my shift I would have to pet/touch him so I also had it. Very good advice! They will get it on their paws too, from walking in it. The oil is on the branches and roots too. Also, the noxious oil can linger on footwear for years. 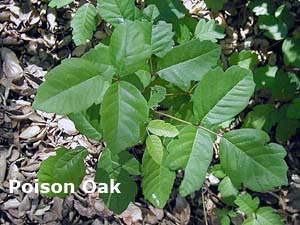 Never burn poison oak leaves/stems–the smoke is toxic. After cutting wood or being in the woods, I use Lye soap. There was an article a short while ago on how to make your own soap and yes it is easy. Anyway, I use the lye soap and scrub the tar out of the infected area. It feels wonderful and knocks the ivy out in a very short time ( it is much cheaper than over the counter remedies and certainly cheaper than a Dr.’s visit). Anyway, I am not scared of going into an ivy patch to get a log that I want anymore. Great article on the hot water and I will try it along with my lye soap. I bought a bar of fels naptha soap at walmart. I get my Fels Naptha at KMart. 1 part Arm & Hammer Laundry Det. I like the crystal effect and it keeps in a jar nicely and is easily measured. OOPs…use shaved Fels Naptha bar as desired. I only use sprinkled in till real pretty looking in at that glass jar!!! Now, how’s that for tech savvy?? My son had an acute allergic reaction to PI and was in the ER to get an IV for meds. There were quite a few I’ll not list them. We have a farm so it’s hard to keep a boy from PI. I appreciate all the advice on here. What is the best way to kill it in fence rows? I have chopped some vines down that were about 5″ in diameter and it oozed oil for about a month from the stump and the vines were still in the trees and infective too. I’ve tried cleaning it out in the winter but found out the hard way that it doesn’t go dormant. I tried the ivy kill roundup from Walmart and it didn’t work. I can’t get a lot of it down because of the place it is located. I can’t dig it up with a tractor. Hoosier, my hubby mixes me up a blend of 2-4-D and diesel fuel in a spray bottle that does the job. Problem is then I still have to deal with the dead brush. If you burn it be sure to stay out of the smoke! Sounds like my Ivy problems are smaller than yours and mine go in the bin for pick-up. Good thing about having goats…they love to eat poison ivy! In my area, we don’t have a lot of poison ivy, but what we do have seems to grow mostly near the rivers or streams. My Grandpa told us as kids that if we got into the poison ivy while out exploring or fishing, to take some mud from the streambed and apply it to the infected area. Leave the mud on until we got home and Grandma would then scrub us down with lye soap. It worked every time. Goats do like to eat poison ivy, which could be a problem if you have dairy goats and need to handle them every day, transferring the oils to your own skin. I have worked outdoors all my life and to this day still get poison Ivey, poison Oak and Sumac on me all the time. I have built up an immunity towards these plants so they don’t effect me. The best advise I can give to anyone that has any of the poisons on them is to not scratch it. Don’t let your clothes rub it. Keep area out of direct sunlight “this will make it dry faster and itch” and if your sweating don’t wipe off. In other words if you get some on you get it off fast as it takes about 15 minutes for the oil to soak in your skin. You can use bleach RL but from what you said it was way to much bleach. One tablespoon of bleach in the water per gallon, rinsed over the area will effectively diffuse any oils and will take a lot of the sting out, I guess you learned that full strength bleach is a form of acid and you must be careful not to use it in its pure form. Another trick is use Epson Salts. Mix up say a cup in a gallon of water and RINSE it like you would a garden hose. You don’t want to “soak” in a Epsom’s Salt bath as this will spread the poison to other parts of the body, but if you have it from head to toe it can only help. You can also make a patch out of a bandanna and Epsom’s Salt. Take a bandanna and make a “wrap or patch” that will cover the area. Use enough salts to make a thick patch. This you wet till it is dripping wet and apply where on infected area, don’t rub but lets the salts water run over the area it will relieve the itch and stop the pain, is but only do this after you have washed off all the oils. This will take the sting out and relieve swelling. You can also us Peroxide and rinse this will remove the oils and will have a bit of sting but remember that Peroxide is a form of acid and may burn some. Regular soap like Dawn dish soap works well but don’t “scrub” let the soap foam in your hands then lightly spread over effected area and let stand for a minute then rinse, Dawn works the best to taking the oils off, it does nothing for the itch or sting. The thing to remember about these plants is that ‘like me” if you are immune to them that doesn’t mean others you come in contact with are immune also. They can get the poison from your clothes and skin just like if they were the ones that messed with the plants. I have to remove my clothes outside, rinse with the hose “my Neighbors love me” then wash my clothes twice with lots of soap and some bleach to remove any poisons. On average 15 -20% of the general population Of Americans who are allergic to poison oak and poison Ivey are so highly sensitive they break out in a rash and begin to swell in 4 to 12 hours instead of the normal 24-48. Their eyes may swell shut and blisters may erupt on their skin. This is one of the few true emergencies in dermatology. Urushiol oil, the active ingredient in poison Ivey and poison oak, is “one of the most potent external toxins doctors know about”. The amount needed to cause a rash in very sensitive people are measured in nanograms and it could take as little as one nanogram to cause infection. Consider that a nanogram as one BILLIONTH of a gram. That means it would take less than 1/4 OUNCE of urushiol to cause a rash on every person on earth! Five hundred people could itch from the amount covering the head of a pin. Just a little insight to how very dangerous this can be to some people. If your one of them think PREVENTION before you go work in poison Ivy or poison oak. Wear long sleeves, gloves, hat and scarf protecting your neck and shoulders. Glasses and some kind of breathing filter. You don’t want to inhale the spores from poison Ivy and poison oak. They can cause more damage inside you than on your skin. Be ready… if you know your going to get it on you have a remedy ready for when your finished. And remember , if your one of the 15-20% who is allergic get to a hospital! Learn what jewelweed looks like, and use that as a poultice. You’ll thank me later. You might have been taught to call them touch me nots or spring aparts, because there is a natural spring mechanism in the seeds. Children in my area play with them. They have a very beautiful but diminutive orange/red flower, much like an orchid in appearance. Nothing beats jewelweed to stop contact dermatitis. It’s as value as learning common plantain (Soldier’s Herb). Neither are any more difficult to identify than honeysuckle, and I guarantee that you can learn both and teach both to your children. We also use plaintain (herb) double tincture, when applied about every 5 minutes x 5 … we an alsmost see the blisters go down. The hot water really does work to take away most of the itching. I did feel stinging sensations though but it was much better than the itching I felt before the hot hot water shower. Thank you for the great tip. If you get into a poison ivy patch, rub Adolph’s meat tenderizer on the infected body part… arms or legs etc. Moisten the area with a little water then liberally apply and rub the meat tenderizer to the area, then let it set for about 15 minutes before washing it off. The papain (from the papaya), in the meat tenderizer will dissolve and neutralize the poison ivy oils. We keep several large jars of Adolph’s around for that purpose. I have one in my chainsaw tool kit. 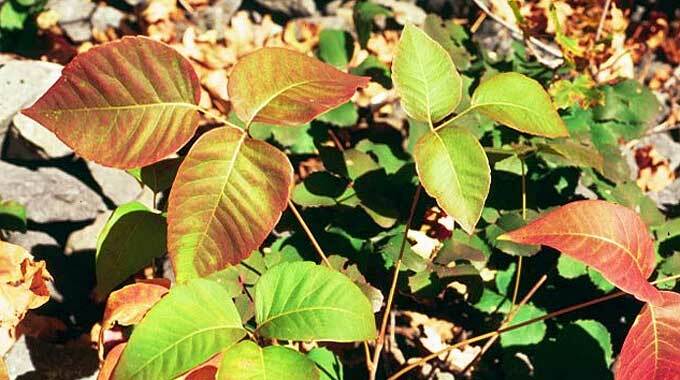 Works on poison Ivy, poison oak and poison Sumac. Also… Although hot water for the itch feels good, it is not a cure. Water alone does not wash off the poison ivy oils and just taking a bath in hot water will spread the poison ivy to other more sensitive parts of your body. Clorox is toxic and taking Benadryl only alleviates some of the itch. Tecnu works some but it is messy and needs to be applied multiple times. I’ve found that meat tenderizer that contains papain will eliminate the need for all of this. Just saying. I have wondered if I am allergic to PI & PO as I am certain that I’ve been exposed on a number of occasions where others got it but not myself. I am wondering if anyone has ever tried any of the classic hand-cleaners such as Goop, Gojo, or Fast Orange? They are designed for grease and oil removal. From my experience in the garage and shop they have to be used undiluted initially. Might be worth the experiment. They work amazingly well on grease and oil. I have wondered if I am allergic to PI & PO as I am certain that I’ve been exposed on a number of occasions where others got it but not myself. I am wondering if anyone has ever tried any of the classic hand-cleaners such as Goop, Gojo, or Fast Orange? They are designed for grease and oil removal. From my experience in the garage and shop they have to be used undiluted initially. Might be worth the experiment. They work amazingly well on grease and oil. I use it after handling jalapeno’s and it cures the fire. For some reason every time I’m dicing these guys I have to itch my eye or nose and this has cured that problem. The hot water treatment for poison ivy itching really works. I have used it a number of times and obtained great relief. However, it should be noted that this treatment can only be used on yourself. Never use it on someone else, especially not on a child who would have more tender skin than an adult and could easily get burned/blistered. Just reading this article and the comments has made me itchy! Being an old school Carpenter and semi-‘sort-of’-outdoorsman, the first 2 items I use are C-4, about 1/3 pound or Napalm in the gallon bucket size, just lite it off and you’ll not be worrying about the Poison Ivy at all. Nooooo; not really. Seriously, I use Acetone, yep, Acetone, it removes the Oils immediately even if the oils have penetrated the pours. Use it liberally as to wash off the oils, than wash well with Dawn Soap; afterwards apply a liberal soaking of Gin internally or First Aid Cream to the skin. FYI; Ladies Cutex Nail Polish Remover has a good percent of Acetone; make sure to get the right one and you’re not allergic to it, if that stuff will cut Nail Polish it WILL cut Poison Ivy Oils. I usually have a gallon of Acetone in the Garage for hobbies, works for me. Make DARN sure you don’t set yourself on fire with it……… it is VERY Flammable. Remember the song about swimming in an ocean of calamine lotion?I wonder if they still make that?Anyway,it offered some relief after a while,if you didn’t realize you got in poison ivy.I crawled through a patch of it when I was fishing one time.Didn’t realize it till later.OH!what an itch.After a warm shower,I put calamine lotion all over it.It definitely helped. After posting my initial comment previously asking if anyone had ever experimented with hand-cleaners to remove the oil I went to amazon and looked up the four most common. Come to find out the Mean Green hand scrub has the exact two active ingredients as Zanfel. Most of the reviews there were people commenting on how effective it is on PI & PO! One reviewer was a chemist who wanted to reverse engineer Zanfel. After getting the MSDA sheet on the Mean Green and noticing that it had the exact active ingredients as Zanfel he stopped his effort. One-tenth the cost. None of the other major cleaners had the same two active ingredients together. As a kid, I would get poison ivy rashes … all summer long. Once I had it bad enough, I had to go to the hospital with swollen eyes, swollen mouth — it was everywhere. That was the time my brother & I played hide and seek in the woods. Back then, I had prescription medication. But other times I had it, my Dad would wipe the rash or blisters with straight-up Clorox. It dried up the rash quickly and I rather enjoyed the stinging sensation on that itchy skin because shortly after that stinging feeling, the itching stopped. Now I can ID the plants and believe it or not, when they pop up in my perennial gardens, I weed them out. I may be wearing gloves, or maybe not. The method to prevent the outbreak is to get inside within 10 minutes or so and wash my hands and forearms well w/ Dawn dishwashing liquid. I wear long pants and socks outside to keep the pests at bay and this protects me from getting poison ivy now. Occasionally, I’ll have a minor patch break out on a hand or a finger and I’m sure it’s from oil that is on one of the dogs’ fur coat that I pet. I still would use Clorox but haven’ had a bad outbreak for a few decades. I dealt with poison oak when I was in California. Unfortunately people have to go through it and the creatures I hunt frequently live in large thickets of the stuff. The coastal hills of California are thick with poison oak. To manage poison oak rashes, I try to keep on hand multiple changes of clothing on hand with most being dedicated working in/with poison oak. I bath in cold water shower using Fels Naptha Soap and change into clean clothing as soon as I can. Being a woodland firefighter meant that I would be exposed to the smoke of burning poison Oak. The hot shower afterwards does allow one to feel almost human afterwards. The ritual behavior of carefully changing your clothes and bathing is good practice for sterile technique. ( in order to prevent cross contamination.) The rash and oils on the skin tend to be at their worst when they are in areas of the body which have a lot of perspiration. ( pits, groin neck and chest). As a squad medic, I kept on hand Benadryl tabs and an epinephrine pen for the ones experiencing a severe allergic reaction. The only better prep is radio and spare batteries to call for a helicopter medevac. I will call for a medevac when I notice the airway being compromised. Better safe than sorry. The initial itch from the hot water itches sooo gooood! It also works great on fire-ant bites and mosquito bites. I keep beeswax/chickweed on hand. It’s great for any skin irritation. Ivy, blisters, rash..it has greatly solved many irritations for Gene and he is in the woods a lot. Not quite on topic, but close. If I ever got stung by a bee, my mother would heat up a glass jar and place it over the stinger. As the jar cooled, it would create a suction (vacuum) and draw out the stinger. I wonder if this would also work with small slivers etc. the hot jar on the skin was nasty, but manageable. My ex (a european) looovved to wear his speedo when swimming. We were camping in a rather private area, so he decided to just hang his speedo on a bush to dry until the next swim. Yep! you guessed it! It was a POISON IVY BUSH!!! He got a lovely rash on his backside. I never laughed so hard. I still get the giggles thinking about it! Benadryl isn’t helpful for poison ivy. The rash isn’t a mast cell mediated reaction like allergic reactions are, its a different type. Benadryl will help you sleep though. Most docs recommend calamine lotion. If the rash spreads to groin, palms, near eyes or is just crazy bad, steroids like prednisone are helpful. I’ll try your advice though. Thanks for all you do Ken! I have had lots of success using rubbing alcohol to remove the poison ivy oil from my skin before the oil has a chance to start making my skin blister. I then follow-up by washing my skin with soap and water after the rubbing alcohol treatment. Works great! Ken, this post says it all. It’s even kind of funny to me to read so many people rushing in to announce their own solutions for P.O. and P.I.–well, whatever helps, must help i suppose. But once you know the hot water trick, the challenge of these plants has simply ended. It’s just no big deal for me anymore to get it all over my forearms or legs. Of course, i have learned over the decades to try especially hard not to get it on my face, and my system has learned not to freak out over it, too–that is, i have gotten less sensitive to it over time (see below). However, the main key is the heat treatment. Ken, if you hadn’t realized this yet, the heat that kills the histamine reaction does not need to be water. You can press a hot mug of coffee or tea upon your bad spots, and hold it there as long as you can, and that will do the same thing. People who have hair blow-dryers say they work, too. By the way, in early research, years ago before the internet when i was trying to find some answer for the way-too-frequent PO problems i encountered, i found that the body learns to deal with these poison plants in two phases: at first, say, little children, don’t get the reaction at all. After a few encounters, though, the immune system starts to recognize the irritant and produce the histamine reaction. People who didn’t think they “got” poison oak or ivy end up eventually getting the reaction. However, after some years, same immune system apparently gets tired of dealing with it, and slacks off. I’ve heard old-timers tell me they’ve been around it so long it just leaves them alone. I’m getting there myself! Cheers for the easy, no-cost natural solution to the itch and burn. Thank you for sharing the good news with the world. Really does! Decades ago when I was pregnant I went berry picking in rural Maryland with a girlfriend. She was from NYC and me from PNW. Neither of us had ever seen poison ivy before. Picked through a very weedy viney patch. Ended up with oozing sores all over, but esp arms and torso. Dr said anything I took for it would probably damage the baby. He explained that histamines, that make you itch, worked on a 12-hour cycle. He told me to get in a bath as hot as I could stand every 12 hours and then scratch the itchy bits like mad, so long as I didn’t beak the skin. He assured me this would release the histamines and I’d be itch free for 10-12 hours. Worked like a charm.